As part of Amazon’s $50M commitment to Computer Science education, Amazon has established the Amazon Future Engineer Pathway. Amazon Future Engineer is a nationwide childhood-to-career initiative making computer science education accessible to students in underrepresented and underserved communities across the country. Through this program, high school students have access to Advanced Placement (AP) Computer Science course offerings, scholarships, and early college internships​. Amazon Future Engineer is intended to inspire, educate, and train children and young adults to explore careers in the field of computer science. This comprehensive program aims to introduce more than 10 million kids each year to the subject of computer science, assist over 100,000 young people in 2,000 high schools in lower income communities take Introductory or Advanced Placement (AP) courses in computer science, and provide 100 students from underrepresented communities with four-year $10,000 scholarships as well as guaranteed internships to gain work experience in computer science. Amazon’s funding provides preparatory lessons, tutorials, and professional development for teachers, fully sequenced and paced digital curriculum for students, and live online support every day of the week for both teachers and students. Students accepted into the program will have access to in-demand Intro to Computer Science and Advanced Placement (AP) Computer Science courses through the curriculum provider, Edhesive, helping them build skills for rewarding careers in technology and innovation. These full-year courses are designed to inspire students and develop their understanding of technology and coding. All students participating in this program will receive a free membership to AWS Educate, which provides them with access to computing power in the AWS Cloud for their coding projects, and content to learn about cloud computing. Students enrolled in the Amazon Future Engineer program will be prepared to pursue a professional career in computer science. The Bureau of Labor Statistics projects that by 2020 there will be 1.4 million computer-science-related jobs available and only 400,000 computer science graduates with the skills to apply for those jobs. Computer science is the fastest growing profession within the Science, Technology, Engineering or Math (STEM) field, but only 8% of STEM graduates earn a computer science degree, with a tiny minority from underprivileged backgrounds. Students from underprivileged backgrounds are 8 to 10 times more likely to pursue college degrees in computer science if they have taken AP computer science in high school. 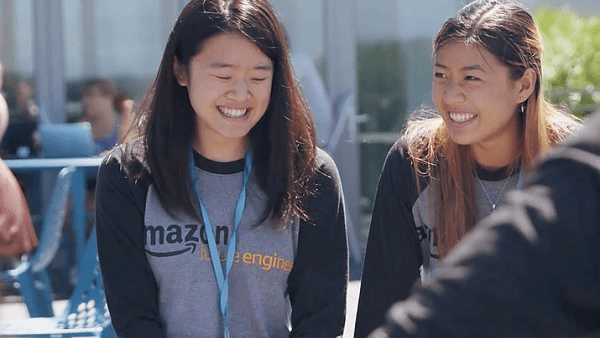 Amazon Future Engineer is now accepting applications from schools for the high school portion of the program, in addition to the K-8, scholarship, and internship stages. Amazon encourages teachers and district leaders to apply on behalf of its students. No previous computer science experience or training is required of teachers. The program is also open to independent learners, including homeschoolers. Independent students are welcome to apply on a rolling basis. Amazon will select participants based on financial need to access the AP courses. Students thinking of applying for the Amazon Future Engineer program should be comfortable with functions, problem-solving strategies that require multiple approaches and collaborative efforts, using a Cartesian (x, y) coordinate system to represent points in a plane, and a strong foundation in mathematical and computational reasoning. (Algebra I and II preferred.) No previous computer science courses are required. Students will need a desktop or laptop computer with reliable internet access. Those interested in applying can do so at www.AmazonFutureEngineer.com. Amazon is guided by four principles: customer obsession, passion for invention, commitment to operational excellence, and long-term thinking. Customer reviews, 1-Click shopping, personalized recommendations, Prime, Fulfillment by Amazon, AWS, Kindle Direct Publishing, Kindle, Fire tablets, Fire TV, Amazon Echo, and Alexa are some of the products and services pioneered by Amazon. For more information, visit amazon.com/about and follow @AmazonNews.